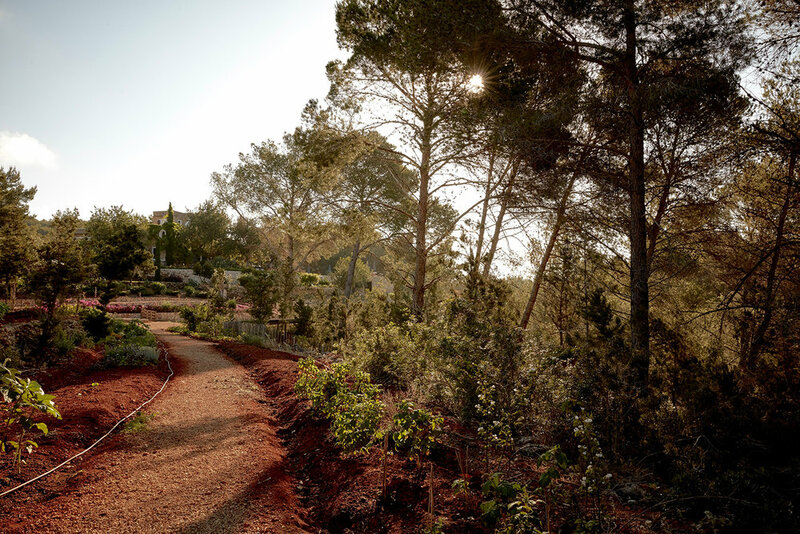 Located in the pastoral interior of Ibiza amid 10 hectares of biodynamic orchards and pine groves is a recent collaboration between Design Hotels and Friends of a Farmer, a group which bills itself as "a creative community forged around the cultivation of art, crops, and inner gardens". A 200 year old farmhouse, marked by classical Iberian architecture with traces of Moorish influences, was converted into a members-only retreat of 9 suites and a private 2 bedroom guesthouse by Dreimeta Design studio led by Armin Fischer. A boho farmhouse aesthetic of minimalist elegance permeates the boutique hotel in a medley of dark burnt wood, distressed wooden furniture, dark painted walls anchored with slabs of slate and stone. Mediterranean gardens surround the sprawling estate with stone terraces, an infinity pool and an outdoor bar. Pared-down, yet luxurious, La Granja is ideal for those seeking a simpler, quieter way of life, surrounded by good food and company. The traditional finca’s rooms are decorated in sleek charcoal and black, with modern conveniences like bars, and stand alone tubs. The thick walls and small windows help it stay cool in the baking heat, retaining the rustic vibe with earthy hues and natural elements. The Intimate Rooms sleep 2 and are furnished with a queen size bed and bathroom. The Garden & Terrace Rooms are larger and accommodate up to 3 people, featuring a private garden or terrace with views overlooking the farm. The Suites sleep 3 and include a separate lounge area with a daybed, bathroom, and a two-level private terrace with 360-degree views. The private Guesthouse accommodates up to 5 people and features 2 separate bedrooms, 2 bathrooms, a lounge area with daybed and a prvate garden overlooking the farm. In partnership with La Granja is the community group Friends of a Farmer, which sponsors workshops and retreats for the member. Chef José Catrimán takes care of the menu which consists mainly out of ingredients coming from the farm, some of them coming from the island (like the fresh fish) and others coming from the mainland. You dine at long communal tables to get a social feeling as well. Breakfast comes served on a platter, and includes scrambled eggs, montaditos (Spanish bread with fresh tomato spread and toppings such as avocado, jamon and manchego), fresh-squeezed juice, and fruit – most of which comes straight from the farm. La Granja Ibiza’s ‘enlightened communal programme'’ of rituals includes ‘sound baths’, group meditation and ‘farmer’s conviviums’, where special guests – including artists, innovators, farmers and activists – are invited to share knowledge. Guests can also enjoy daily sunset DJ sets by the pool. La Granja is located 25minutes from the Ibiza airport, 10 minutes from Santa Gertudis and 15 minutes from Ibiza Town. La Granja is membership-only, which is an annual cost of 200 euro per season. The La Granja estate is also available to rent out in its entirety. Inquire for more info. Although there are five ground-floor suites, many of the public areas are accessed by steps. There is lots to see on Ibiza, including some spectacular beaches, but we feel this property is best experienced by taking advantage of what it offers on site, including slow-food workshops, yoga, and experiencing the slowed down pace of the island.